Some customers do not want to provide their credit card information or want to pay based on their payment terms. These customers still can pay their invoices via credit card through a payment portal. This payment portal is a service provided by the gateway, where customers can go to and securely enter their credit card information. Payments made through the payment portal will be downloaded into Microsoft Dynamics 365 Business Central. These payments then will be posted against the customer’s ledger entries and applied to invoices to close out the appropriate invoices that were paid. To be able to use this functionality, a new service connection is setup automatically. You can access the page “Service Connections” through the search box or Setup & Extensions -> Service Connections. One service connections will automatically be setup for each merchant account. You typically do not need to touch this setting. 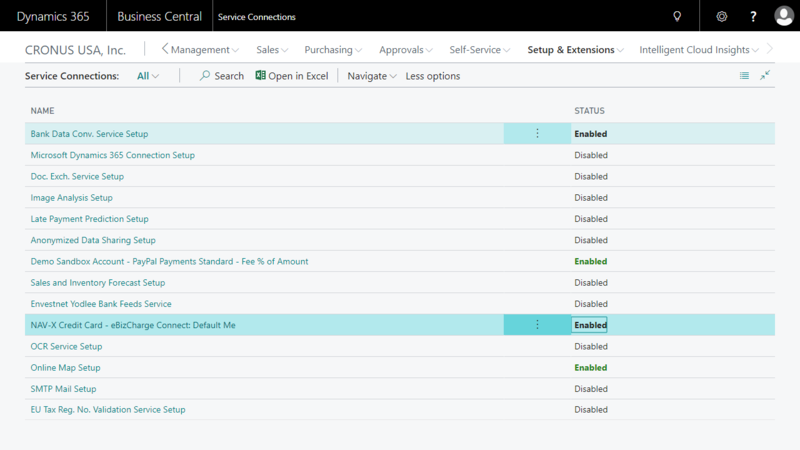 To configure the service connection, select it an click on the action “Setup”. This will open the service connection card. 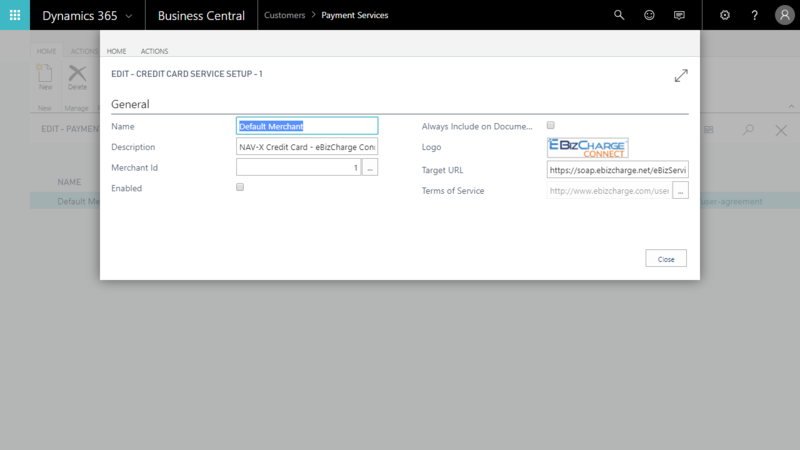 A service connection is automatically created for each merchant that you are entering. It is also activated automatically. You can make changes to this, but it typically is not required. If you want to include this service connection as the default service on all invoices, you can select the “Always include on Documents” flag. If this is not selected, you can still define the service connection to be used for specific customers or on specific documents. Go here to learn more about this.